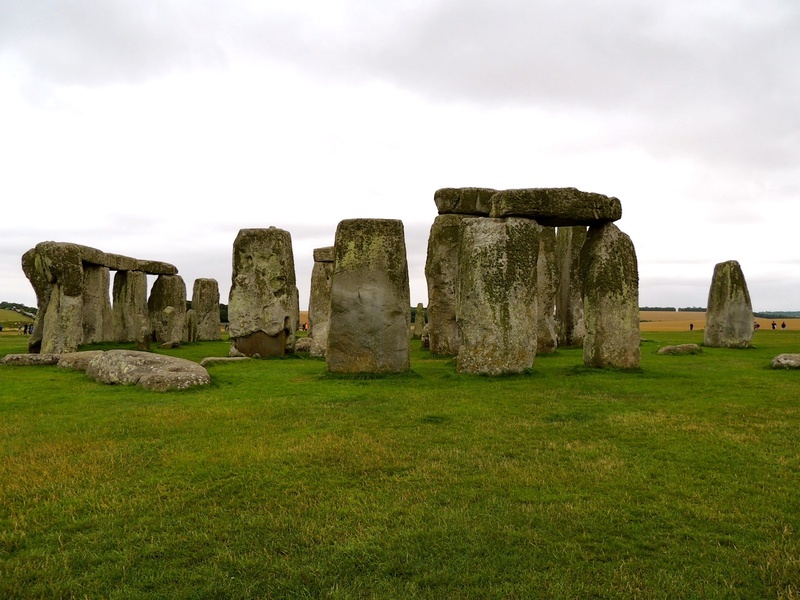 One of the most ancient sites I’ve visited recently, is the prehistoric monument of Stonehenge in Wiltshire, England. I remember visiting Stonehenge many years ago, when one could just park at the side of the road and walk across the field to it. At that time, there was no-one minding the site, and you could just climb all over the stones at will. This time, it was quite a different experience, as it is now a UNESCO World Heritage site. We had to queue for ages to get into the car park, which of course wasn’t free, and then wait in line for almost an hour in the wind and rain, to buy tickets to get into the actual site. We couldn’t go anywhere near the stones, as it was all cordoned off, so had to be content with taking photos from some distance away. 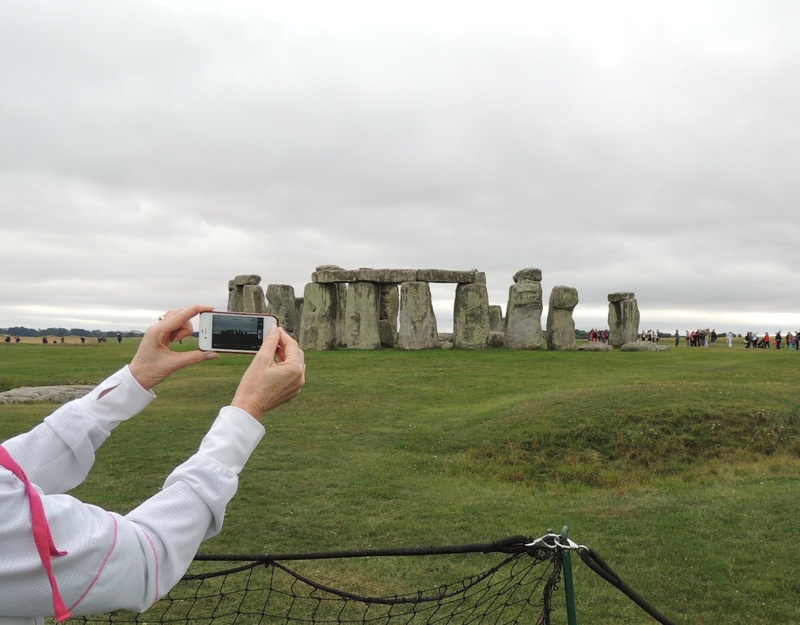 If you look closely, you can see a few ‘modern’ people behind the ‘ancient’ stones. 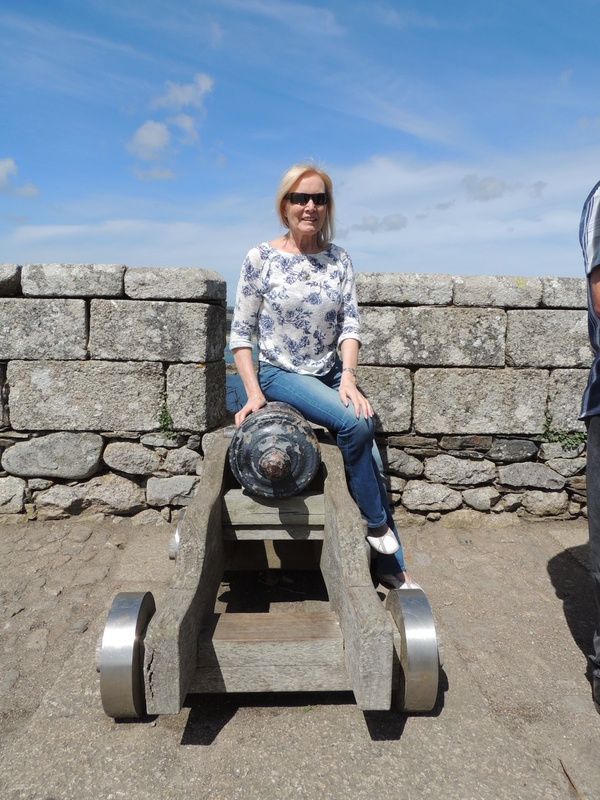 Whilst in Cornwall a few weeks ago, we visited the Castle of St. Michael’s Mount. 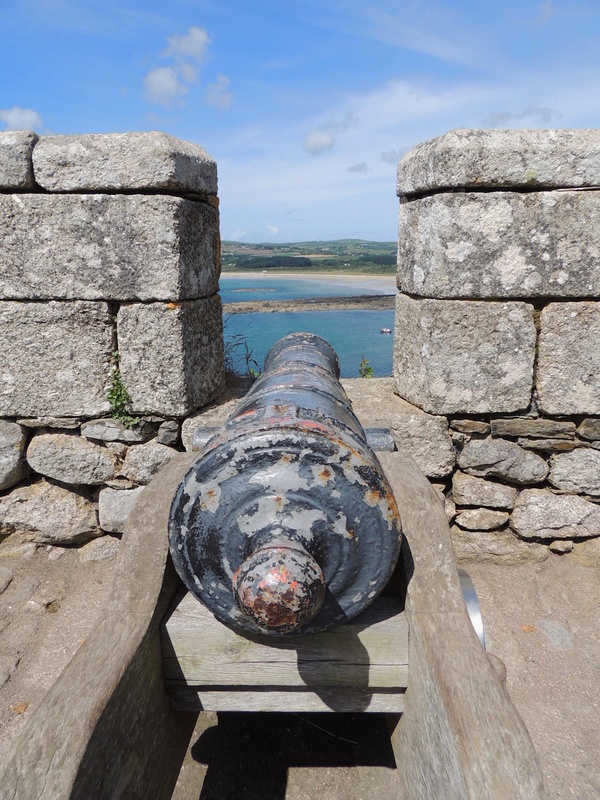 There is a row of ancient cannons along the medieval battlements, presumably put there to defend the castle from invaders. 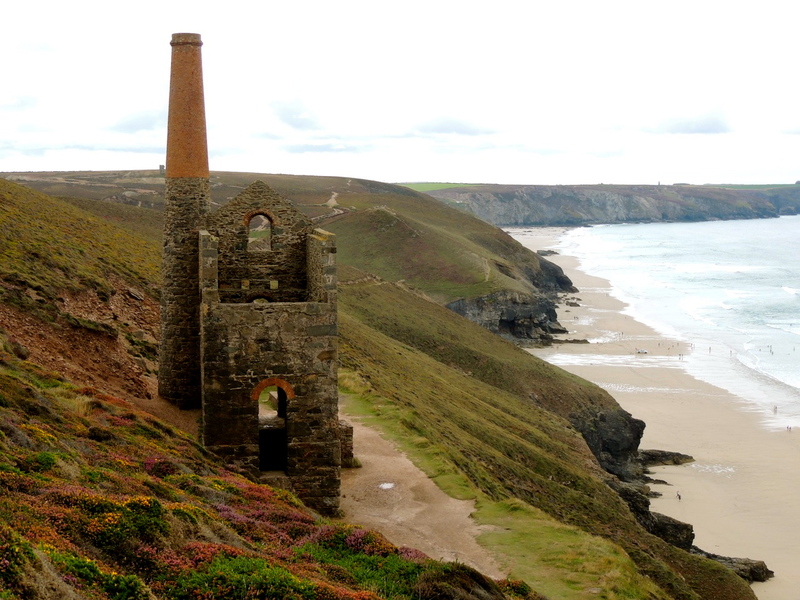 Last but not least, is the old Wheal Coates tin mine which I just had to see for myself after admiring Chillbrook’s wonderful photos of places around Cornwall. Some of you have seen this before, but it does fit in with the ancient and modern, so here it is again. 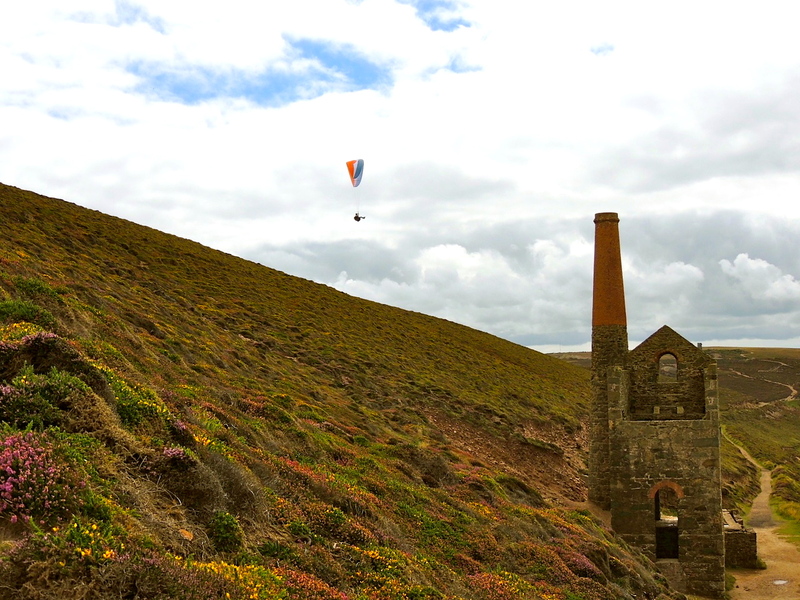 Quite fortuitously, whilst I was gazing upwards, an intrepid and very modern paraglider obligingly drifted into view. I hope you’ve enjoyed my ‘ancient and modern’ pics for the CBBH Challenge. There’ll be a new challenge out at the beginning of September, so watch out for it and do take part. 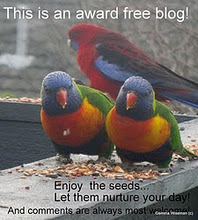 George Weaver of the ‘She Kept a Parrot’ blog. Her “random thoughts, ideas and photographs” are really fascinating. Mariayarri’s photography blog is simply stunning and she always has an English translation for those of us who don’t understand Swedish. 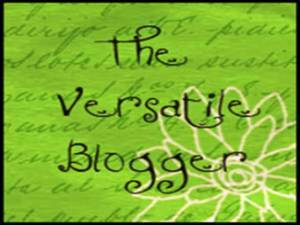 Yarri is Maria’s beloved dog, with whom she shares her adventures. What a breathtaking sight is this Gothic masterpiece! 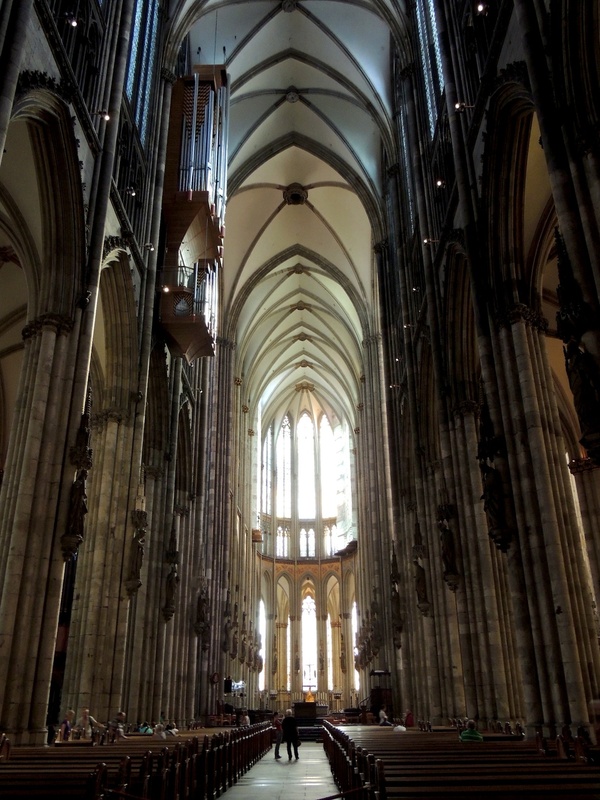 The construction of Cologne Cathedral was begun in 1248, and wasn’t completed until 1880. In 1530, work on the church stopped, but the crane stood on top of the building for 300 years, as a symbol of hope that it would one day be completed. When it was finished in 1880, it was the tallest building in the world. The foundations were 50 feet deep and there were 10,000 sq metres of glass in the windows. In 1996, the cathedral was added to the Unesco World Heritage list of culturally important sites. On entering this magnificent building, I was absolutely amazed at the height of the ceilings and the light streaming in through the windows behind the altar, which seemed to bathe everything in a celestial glow. There are countless stained glass windows, each one very beautiful and quite different from the other. 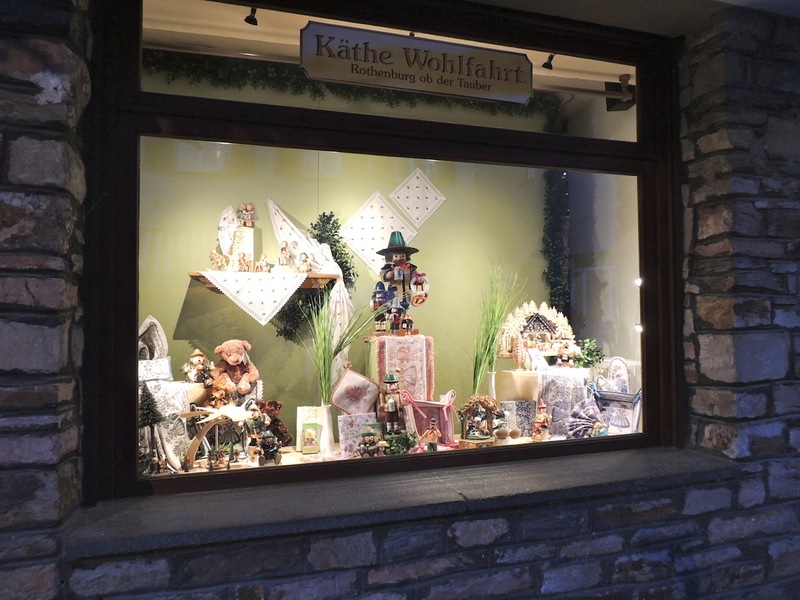 As you can imagine, it’s impossible to do the windows justice with photos. 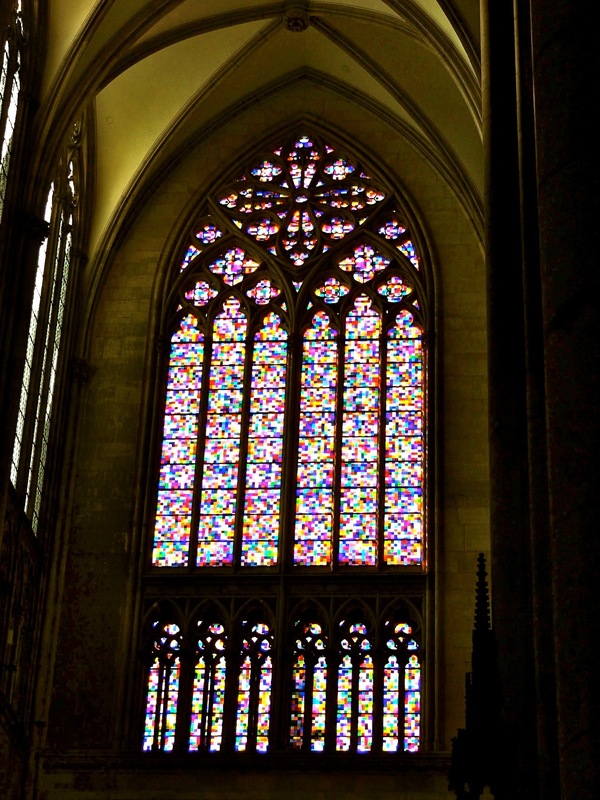 We were told that coloured glass was thought to be the nearest thing to Heaven’s light, and thus captured the imagination of the people of the Middle Ages. 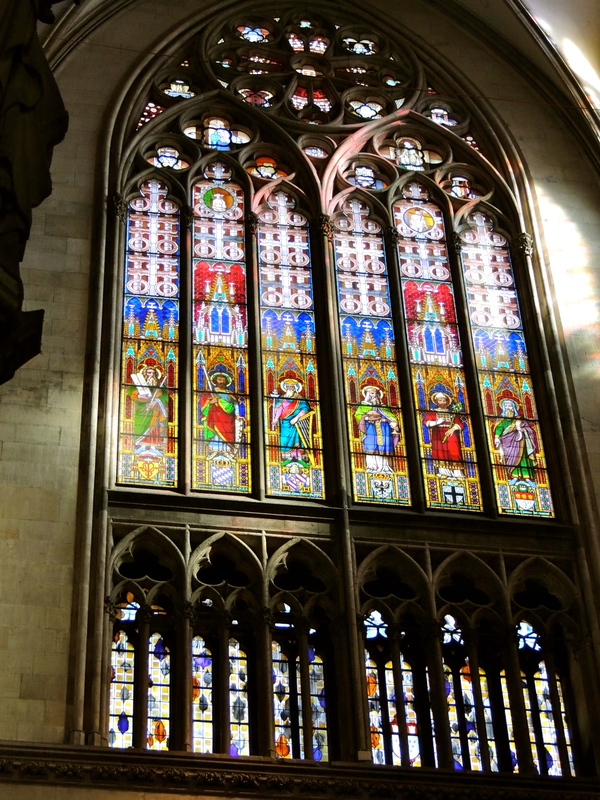 The faithful who were mostly illiterate, received the message of the Gospel verbally, and their faith was encouraged by such reinforcing visual images, created by light reflected from these windows. Most of the windows are original, as they were taken out and put in a place of safety before the bombings of the two world wars. 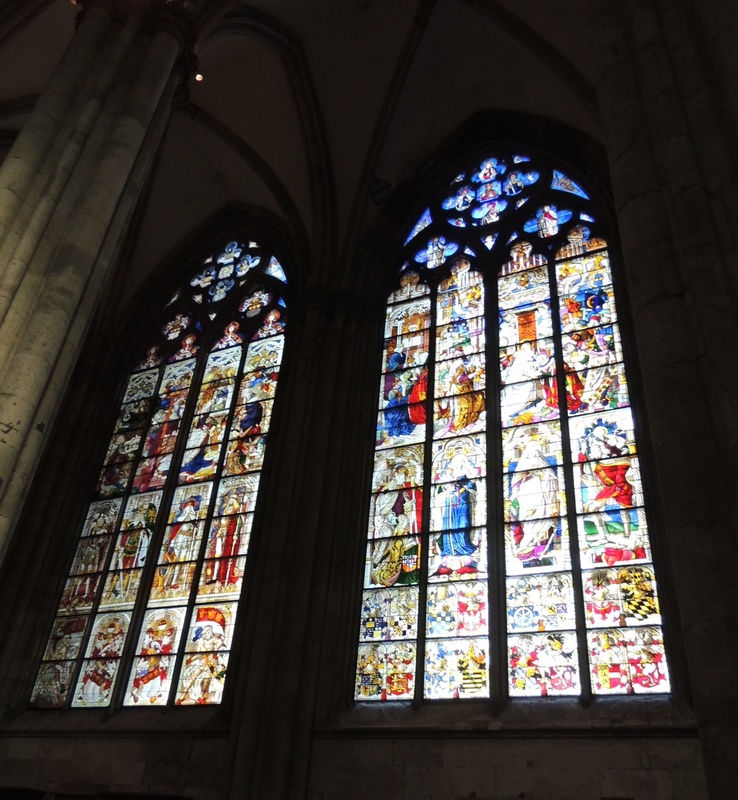 Much of the church was damaged during the bombings, but the windows were luckily unscathed. 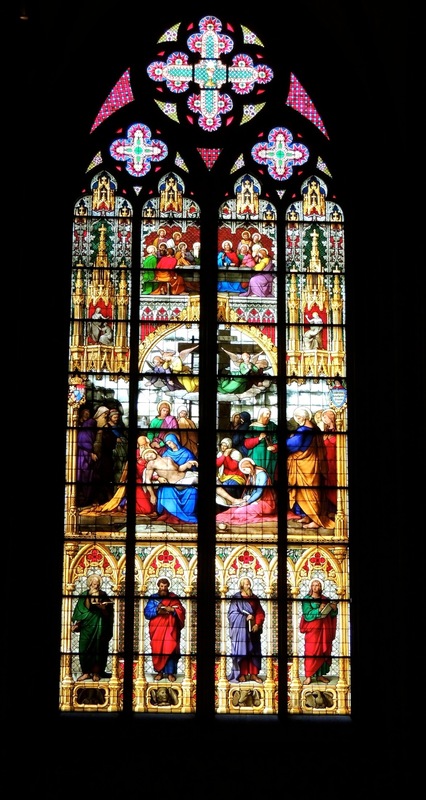 The most recent window in the cathedral was unveiled in 2007. It was designed by the famous German artist, Gerhard Richter, and is made up of 11,200 identically sized squares of glass. This very modern window is a veritable kaleidoscope of colours, and some people don’t like it at all. What do you think? I hope you’ve enjoyed my windows for the Thursday theme. 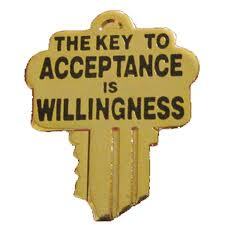 To see more of this week’s interpretations of the challenge, just click here. 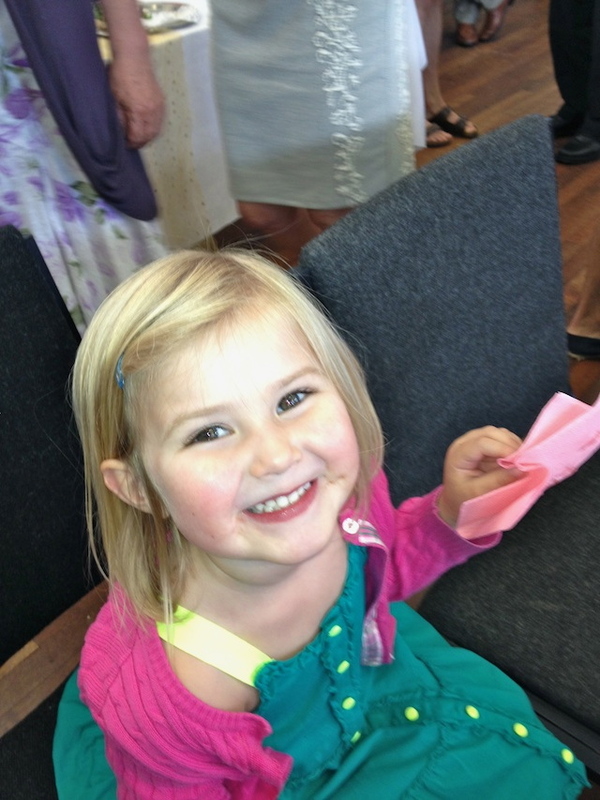 Well my holiday is over and I have so many photos to share, but here are two of my favourites. 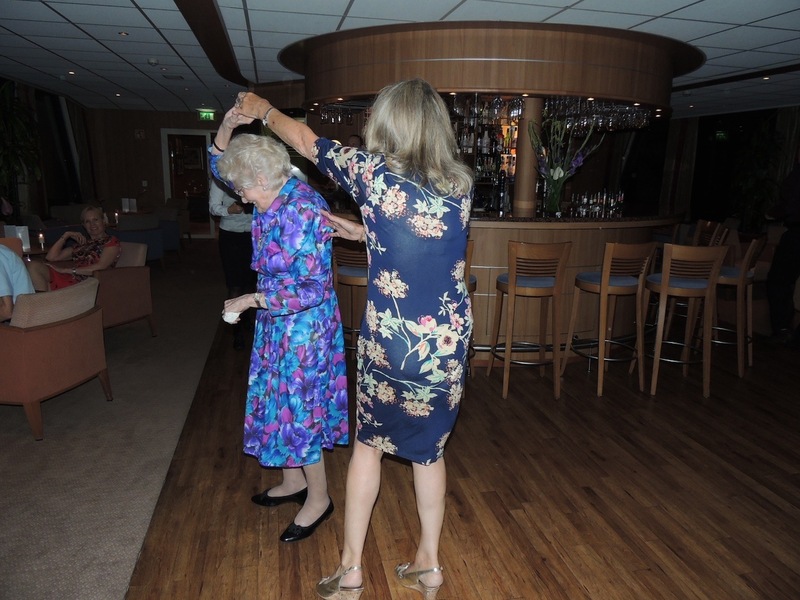 Here is my 100-year-old mom-in-law and her youngest daughter, rocking the night away on board ship. 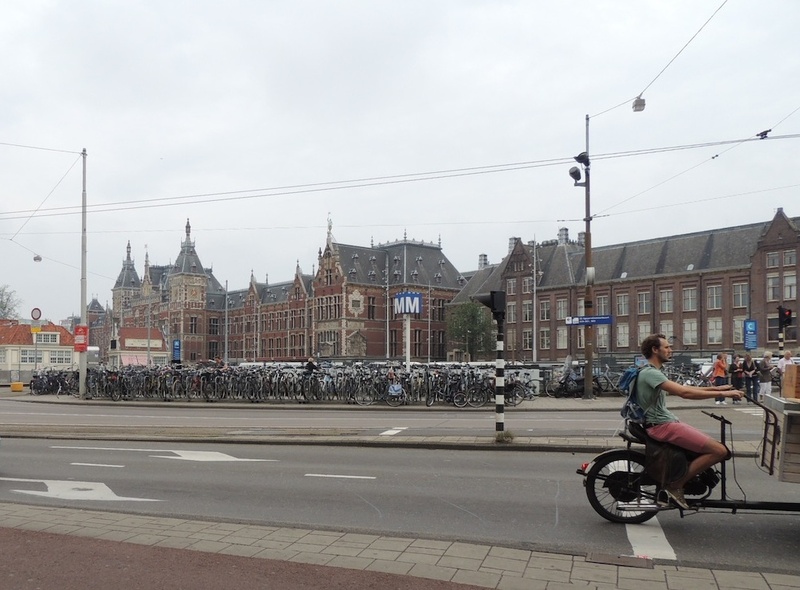 Glimpses of Amsterdam, and then home to Florida. 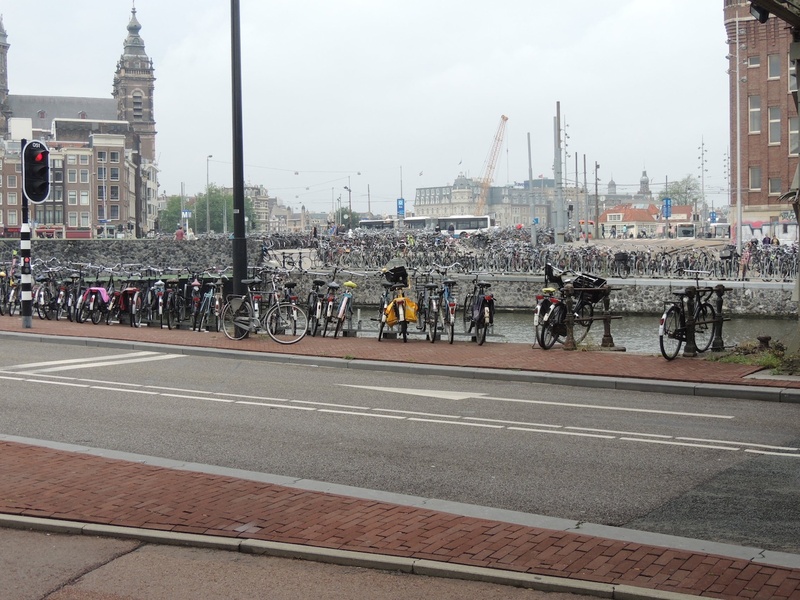 Whilst dodging the ‘flying’ cyclists who don’t slow down or stop for anyone, I saw even more bikes. Can you see the hundreds more stacked up across the canal? 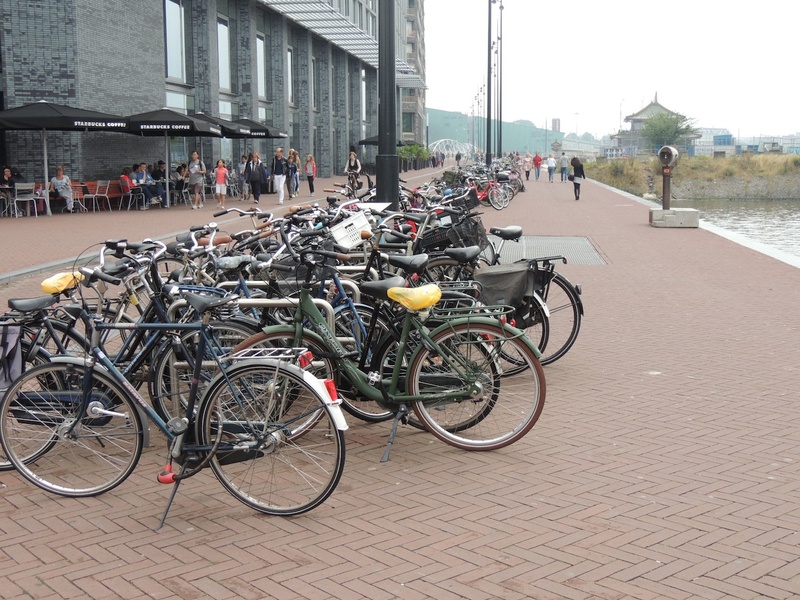 Can you just hazard a guess as to what is the most popular mode of transport in Amsterdam? 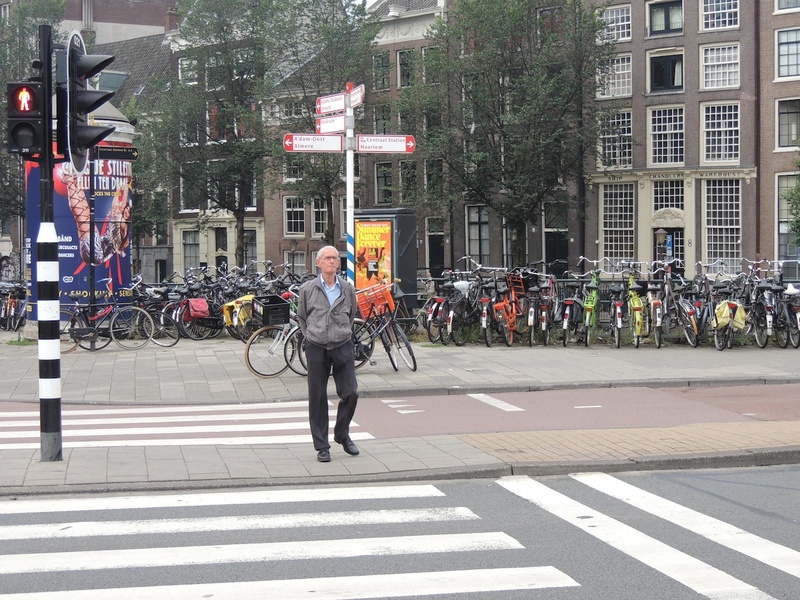 Ah, here’s one guy who doesn’t seem to have a bike. 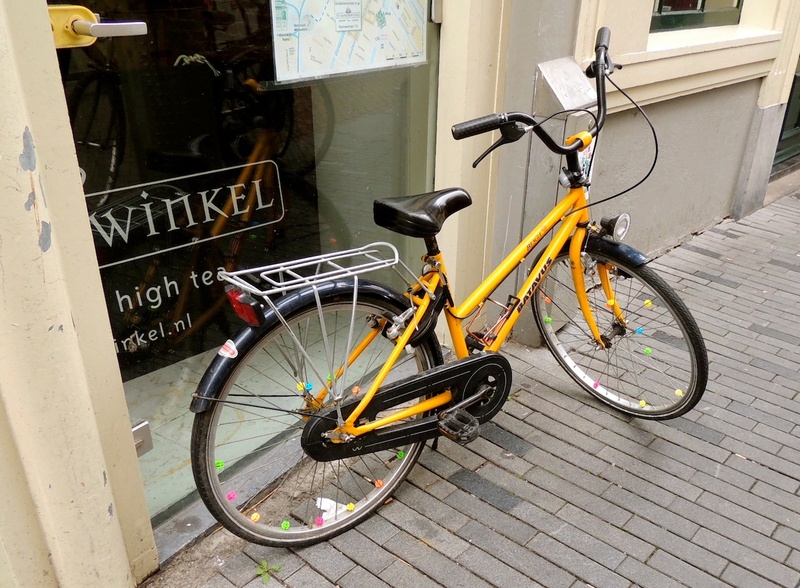 The owner of this one obviously likes to pretty things up a bit, judging by all the colourful flowers on the spokes. 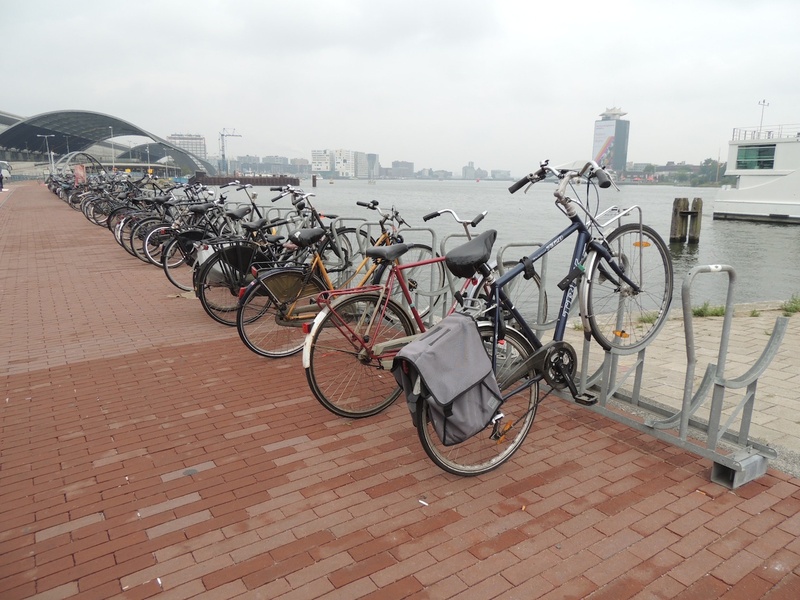 Many workers travel to work by train, but as you can see, they leave their bikes outside the station. 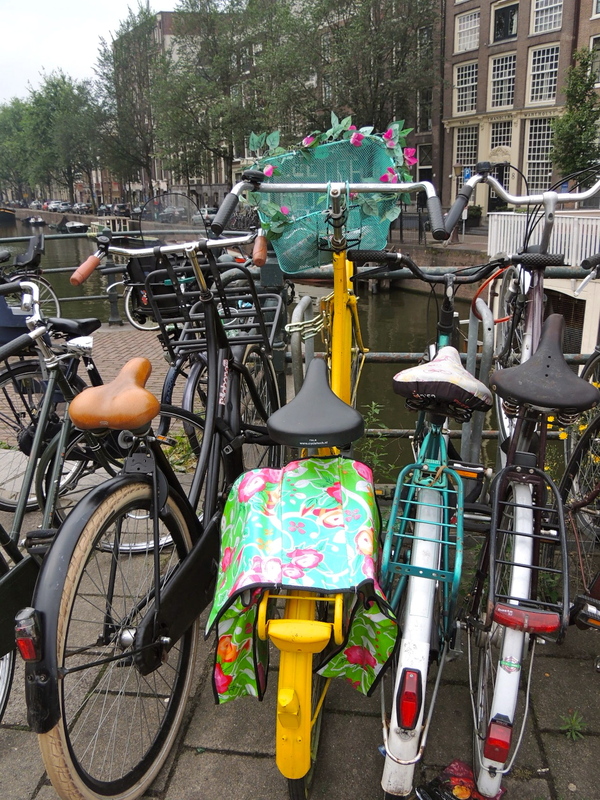 I wonder how they identify their own bike out of this lot. You want a coffee? 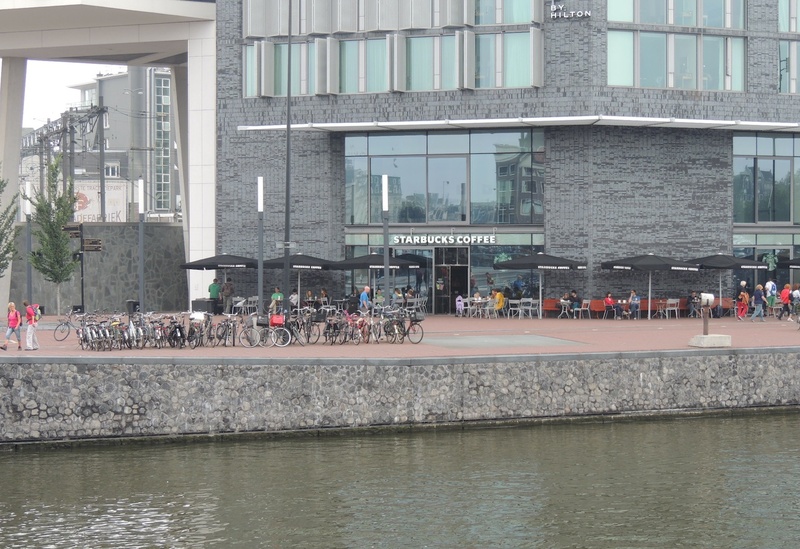 Just ride your bike over to Starbucks. 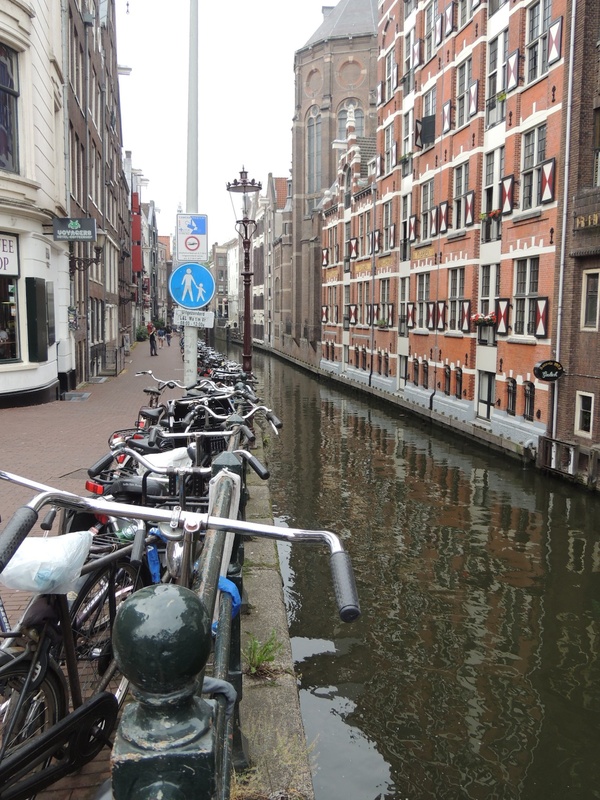 Every canal is lined with bicycles. 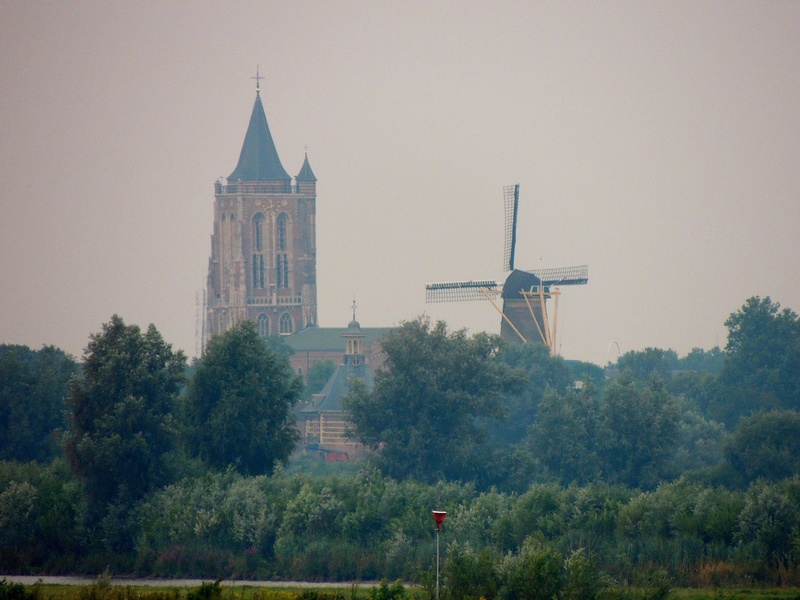 Yesterday as we sailed into die Nederlands, the focus seemed to be on windmills, and I thought you might also like to see some of what I saw along the riverbank. 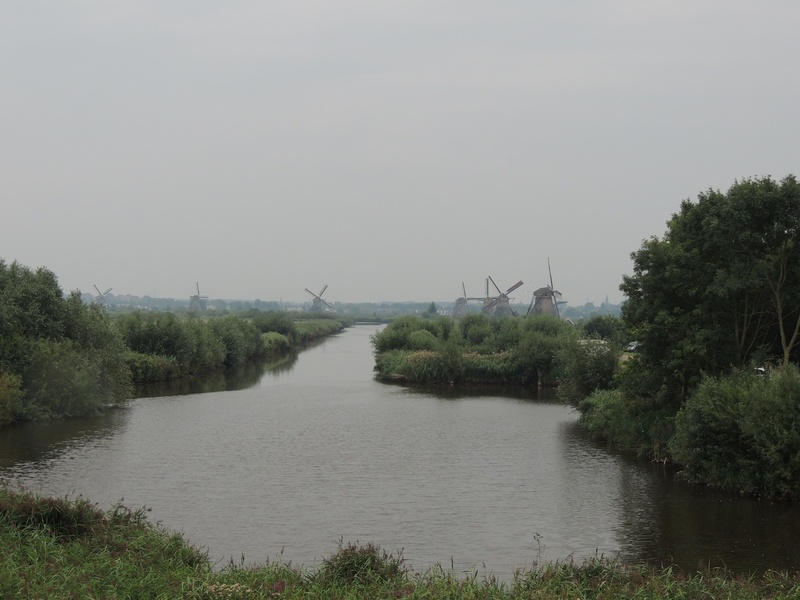 Windmills are an essential part of the Dutch landscape, and responsible for keeping half the country above water. They convert the energy of wind into rotational energy by means of vanes, which are called sails. 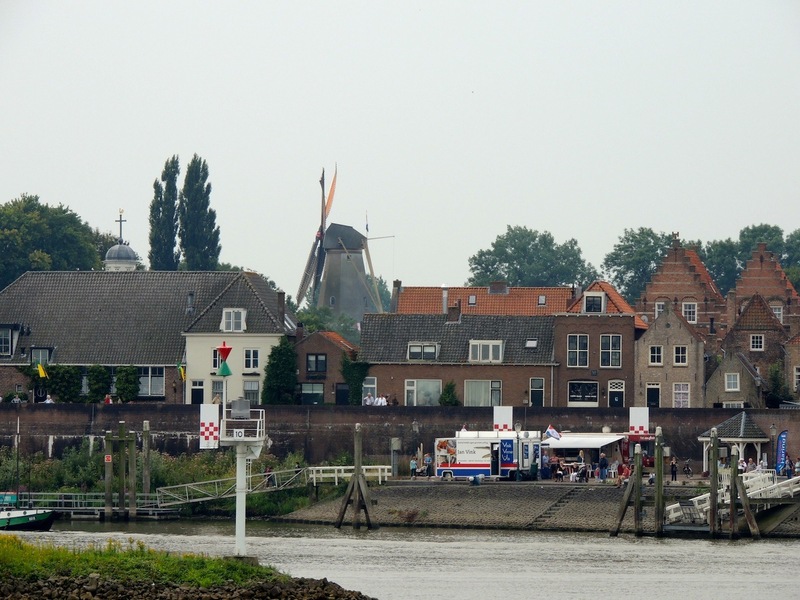 There are still over a thousand windmills throughout the Netherlands and they are often the first thing that people recall about the country. I remember visiting some of my dad’s family in Amsterdam when I was a child, and the windmills left a lasting impression on my memory. 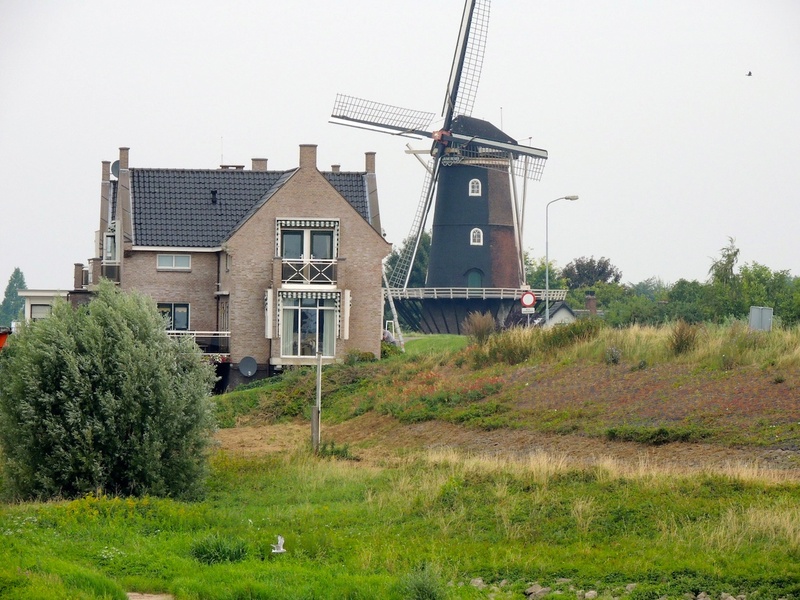 Windmills are said to have existed in Holland from about 1200, and today, are characteristic of the Dutch landscape and a symbol of the Dutch people’s endless struggle with water. 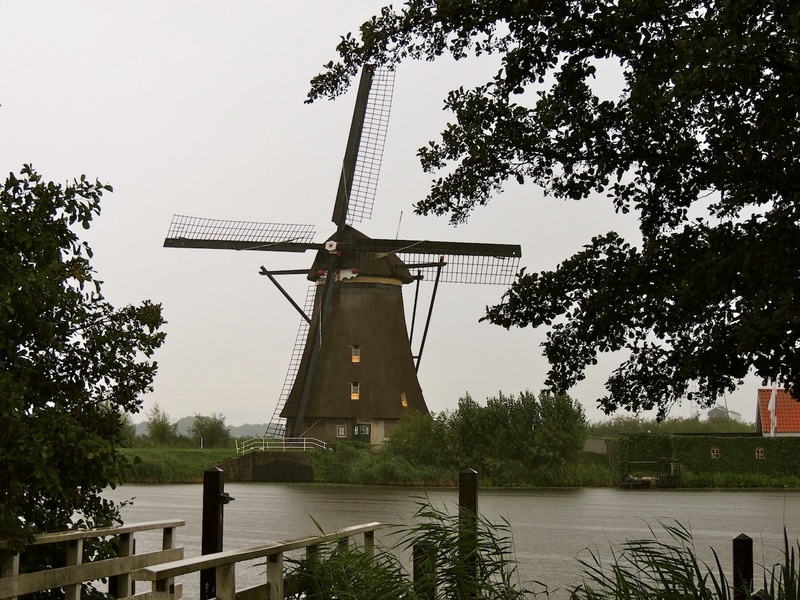 In the nineteenth century, Holland had about 9,500 windmills. Can you imagine what it must have been like with all those turning sails, working virtually day and night? Originally windmills were developed for milling grain for food production, but over time they were adapted to many other industrial uses. An important non-milling use is to pump land water for drainage. 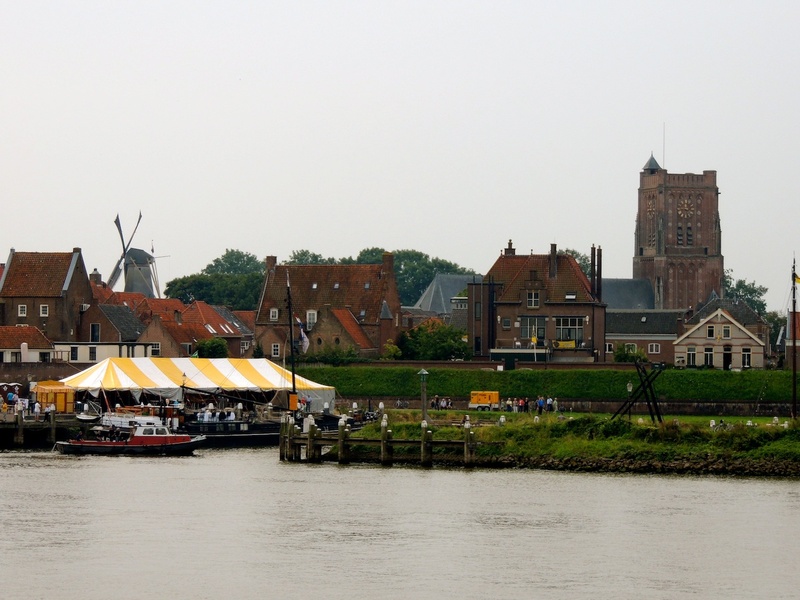 Since the 16th century, the Dutch have made more and more progress in the fight against their hereditary foe, water, and have managed to keep their country dry, in spite of the fact that it lies several feet below sea level. 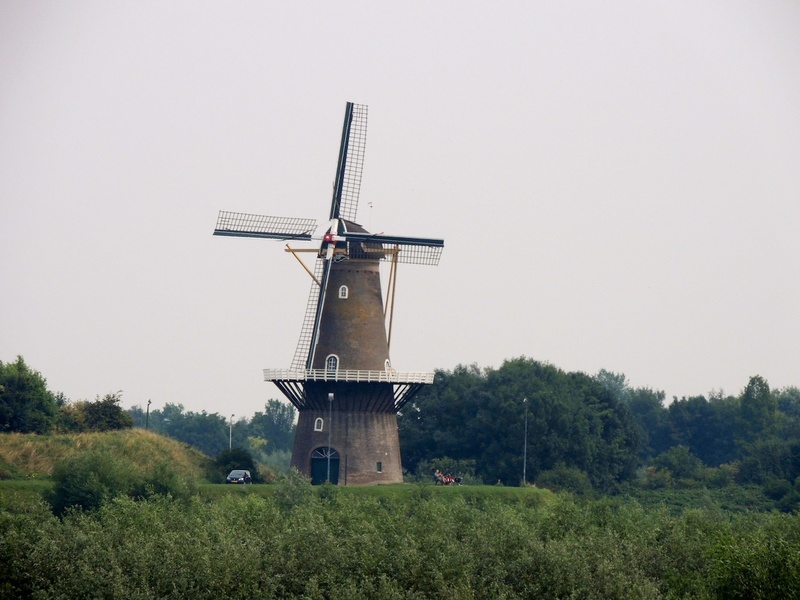 Holland owes its creation as well as its development in the most literal sense to the windmills, for it was thanks solely to the windmills that is was possible to repeatedly reclaim new land for the evergrowing population. Since the 16th century, many Dutch people have been living on land that lies below sea level, or has even been reclaimed from the sea. 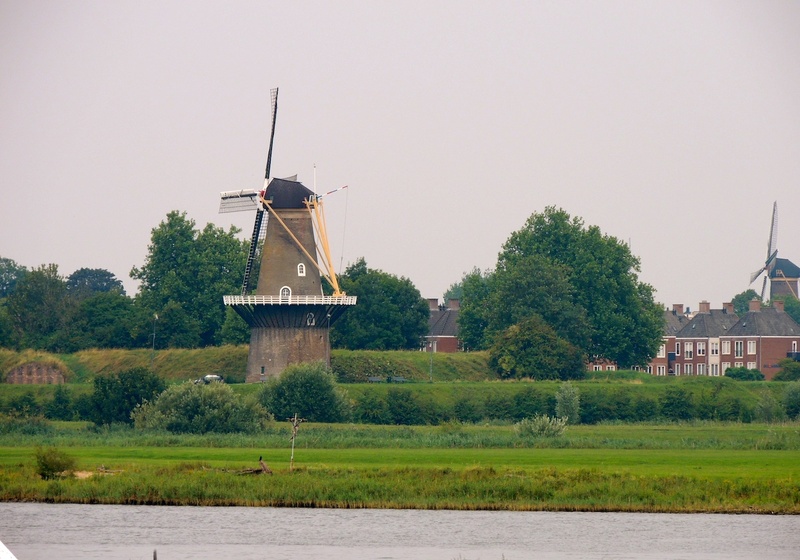 In order to make this possible, windmills were used to drain the ‘polders’ and keep them dry. Late yesterday afternoon, we went on a tour of Kinderdijk, a UNESCO World Heritage Site, one of the most picturesque and iconic sites in Holland. 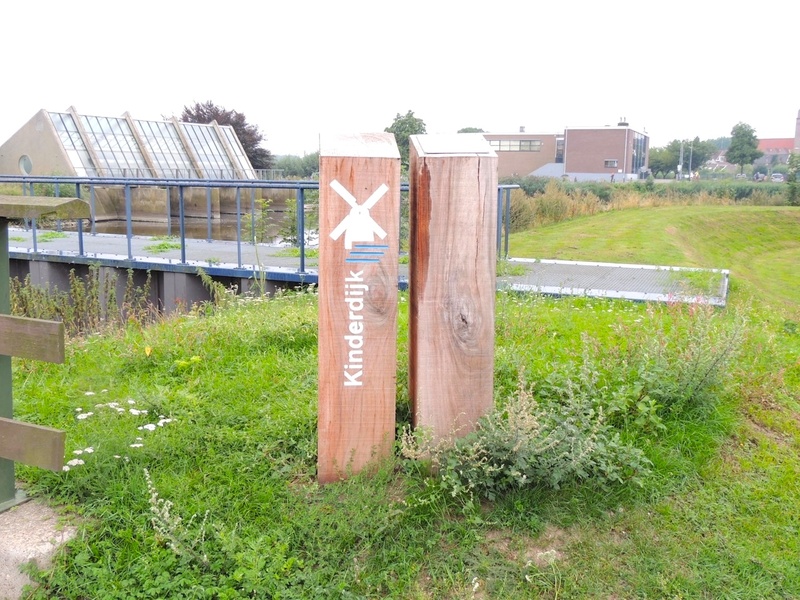 Kinderdijk got its name after a notorious flood which devastated the area in 1421. 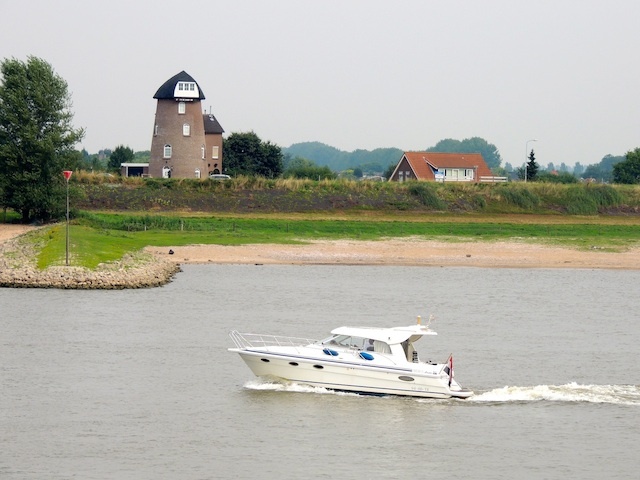 A heavy storm off the North Sea coast caused tsunami-like waves that broke through the dikes, swallowing the surrounding villages. Legends were told about the tragic event which claimed thousands of lives. One such legend was about a child in a cradle that was kept afloat by a cat jumping from side to side, in order to keep it balanced. 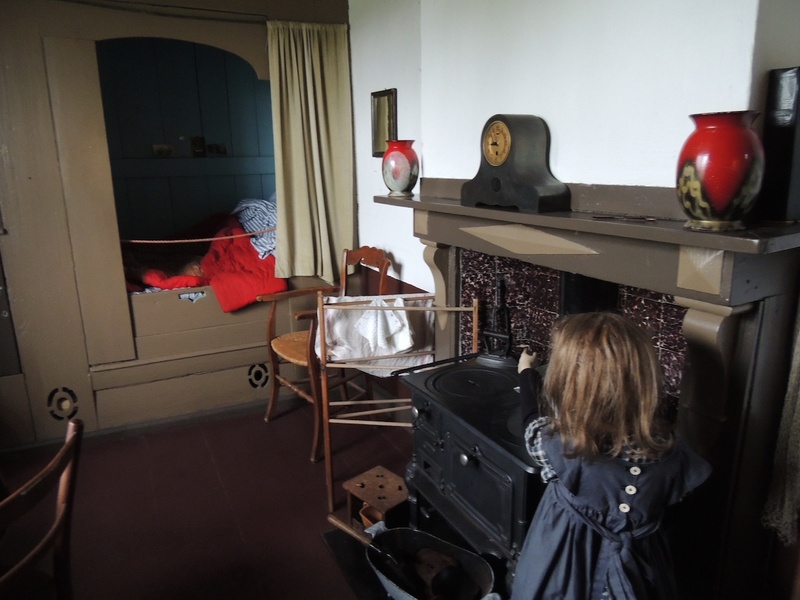 The cat and the cradle became a popular fairytale, and the area became known as “Child’s Dike” which is Kinderdijk in Dutch. To this day, all the cats around windmills are protected and honoured as “windmill cats.” Here is a reconstructed room in one of the windmills. 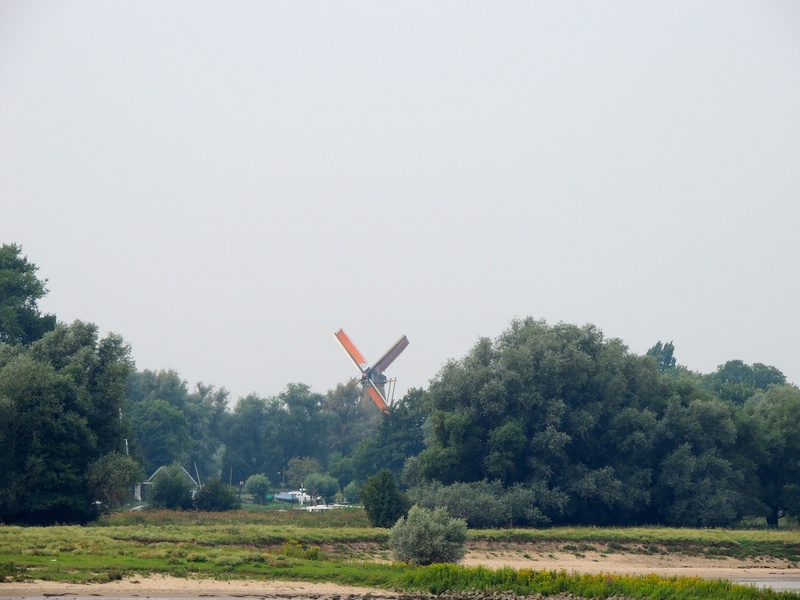 I hope you’ve enjoyed my post entirely focused on windmills. 🙂 To see more interpretations of the challenge, just click here. 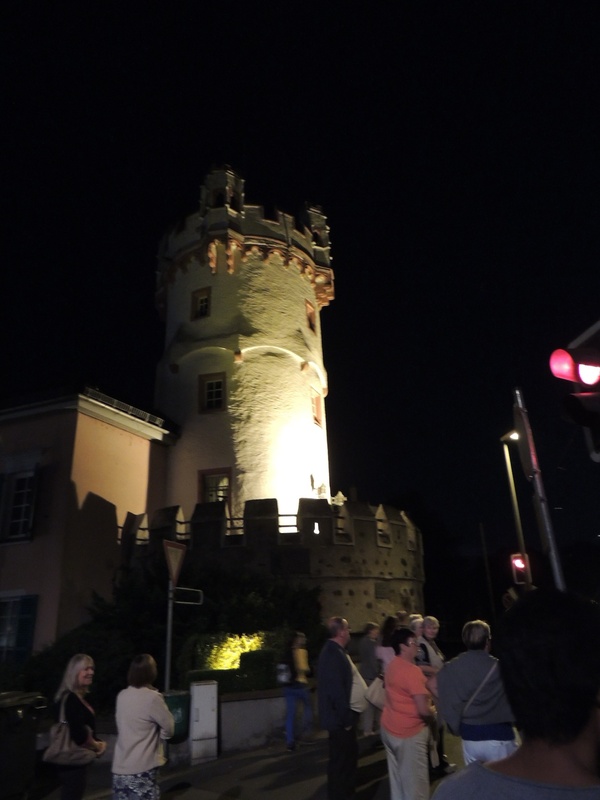 Thanks for the memory…….Castles on the Rhine. 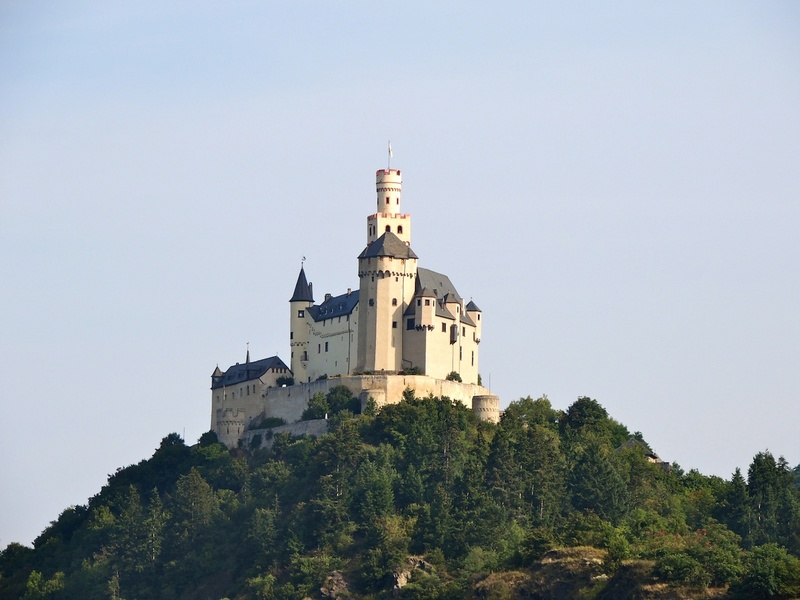 As we neared Braubach, we caught sight of the beautiful Marksburg Castle, the only hill castle along the Rhine which has never been destroyed, making it the most original castle in the entire valley of the Loreley. We were able to visit it later, but that’s a post for another day. 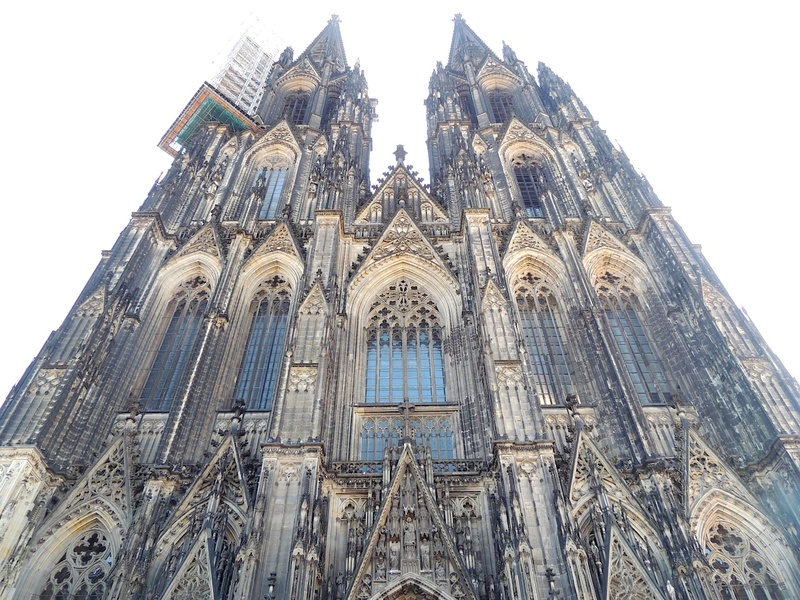 Today we are in Cologne, and I’ve been out most of the day looking at the magnificent cathedral. 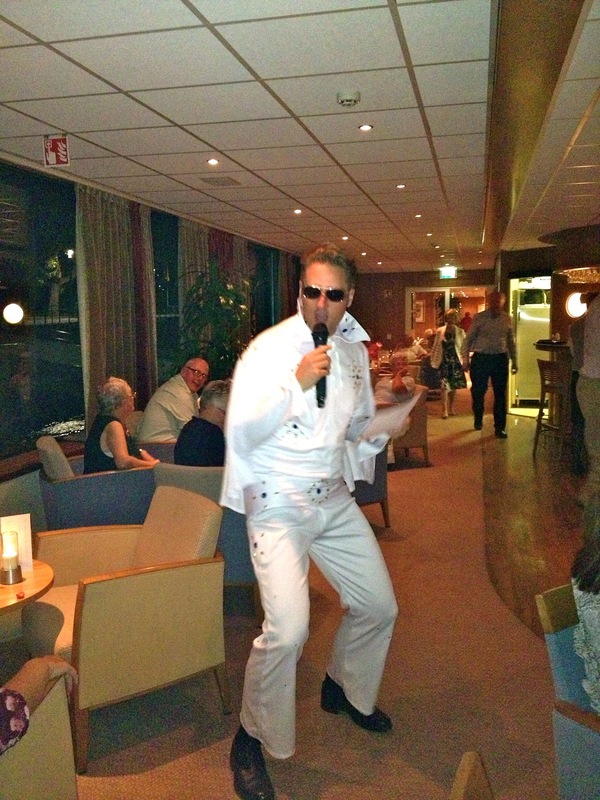 Tonight we have a classical music evening after dinner, in sharp contrast to last night’s entertainment, which ended up with our young Program Director doing a very convincing impersonation of Elvis singing ‘All Shook Up’. His white suit, dark shades and hip gyrations were right on the nail. 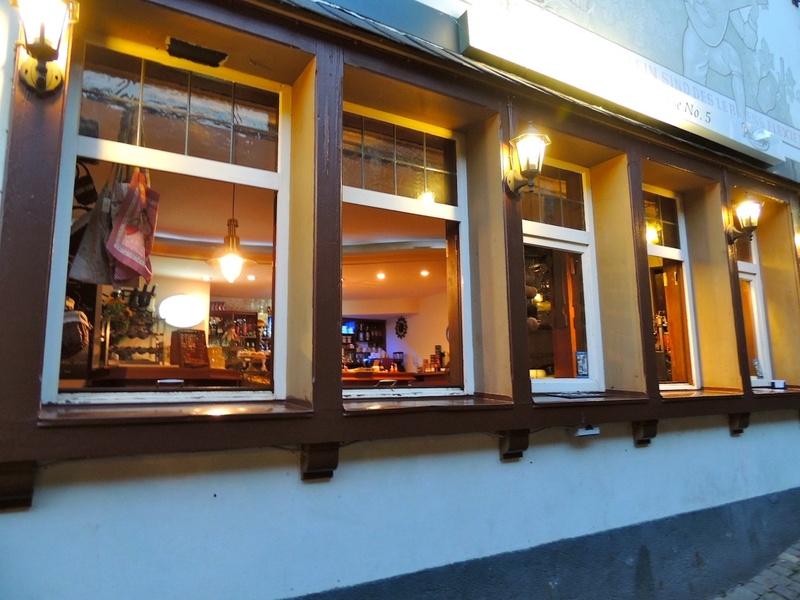 An evening in Rüdesheim, featuring windows, and a castle on the hill. 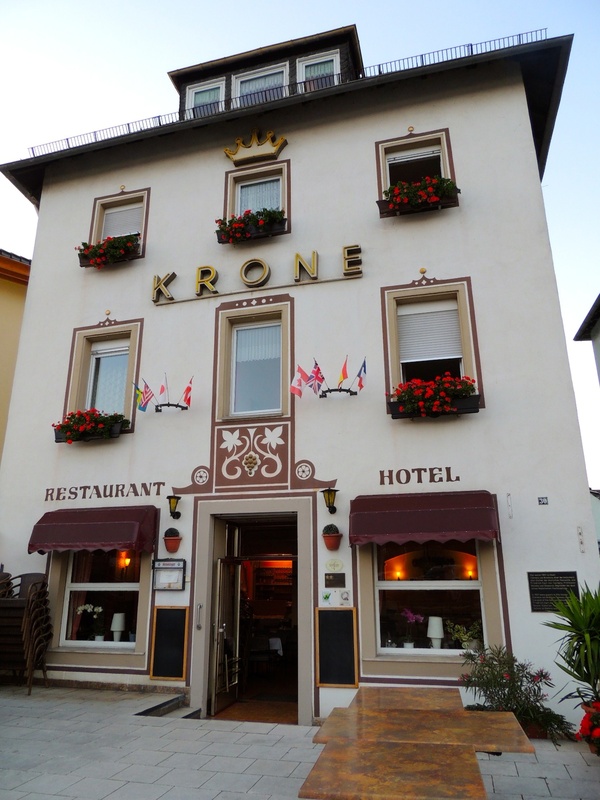 Last night our cruise ship docked in Rüdesheim, a pretty wine-making town in the Rhine Gorge. 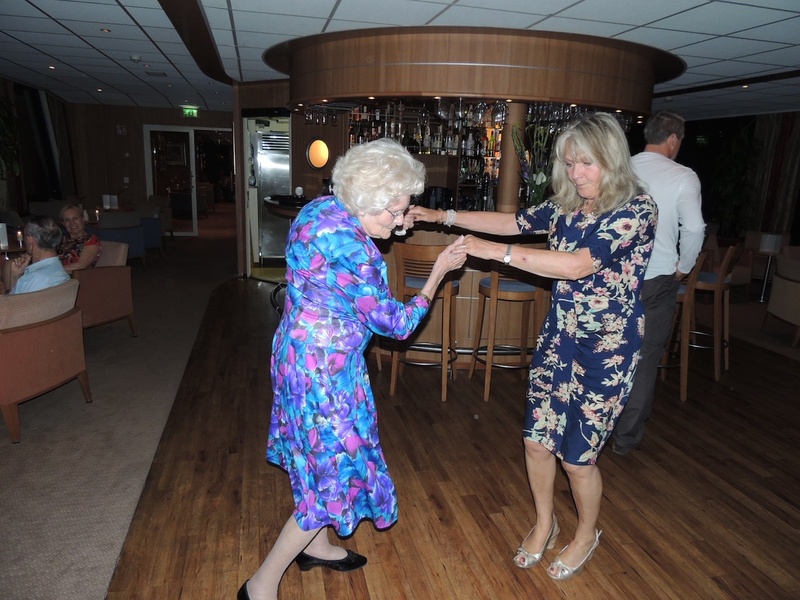 After dinner on board, we decided to go ashore and seek out the night life. 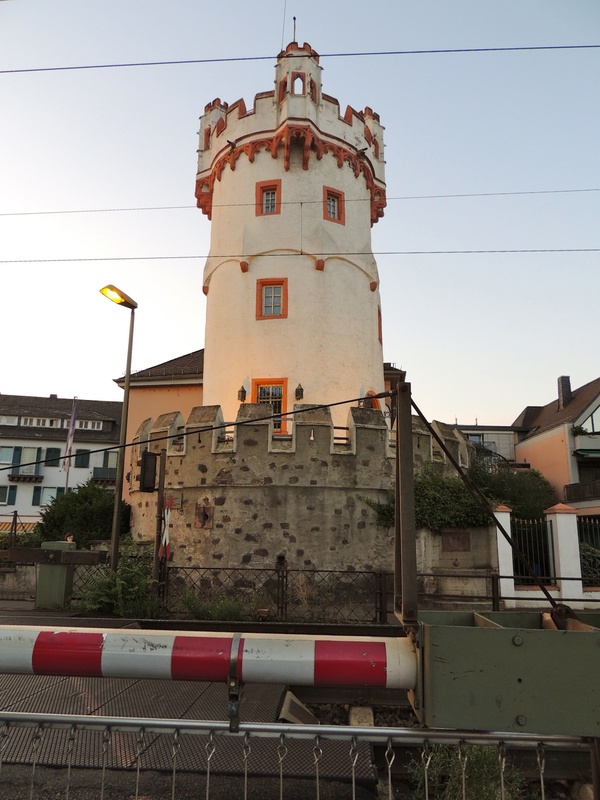 We had to wait quite a few minutes for four trains to come past, before we were allowed to cross the line, and I decided that this quaint little tower was really worth a photo. 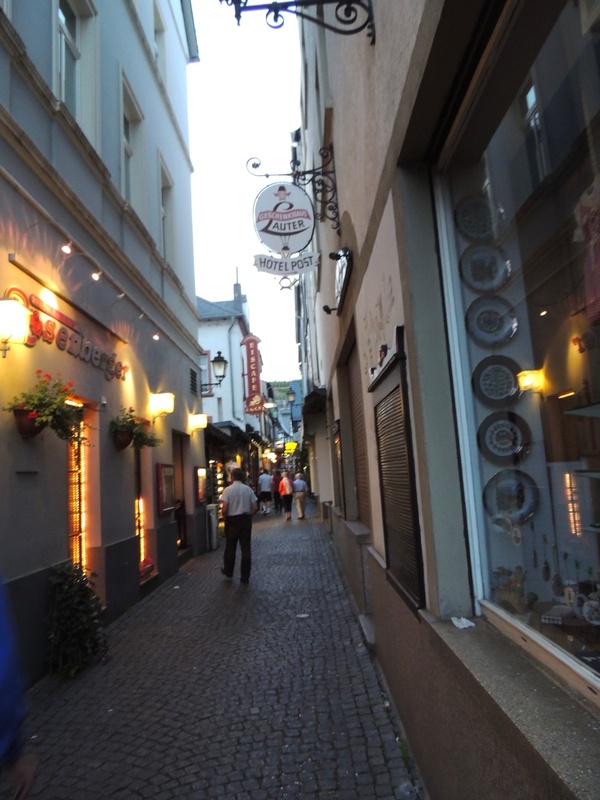 Once safely across, we wandered the narrow lanes lined with bars and restaurants. 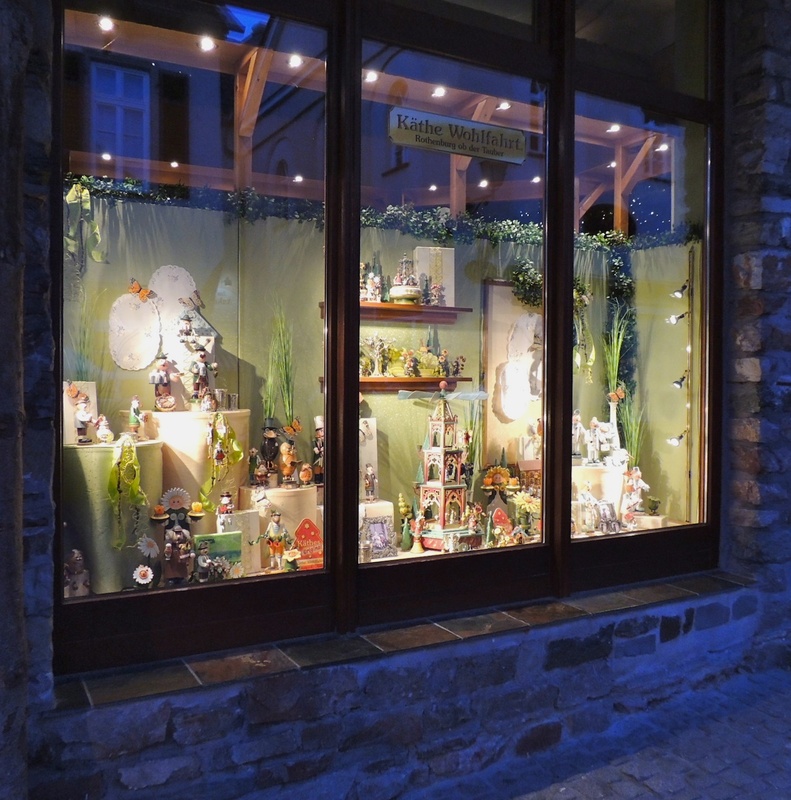 There were some very cute ornaments in this Christmas shop. 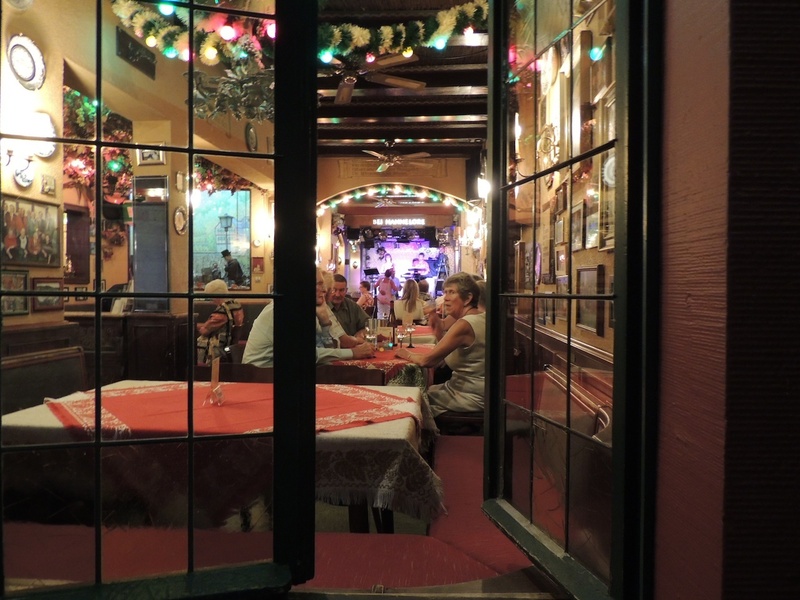 The brightly lit restaurants looked really inviting, and most had live music playing. We’d already eaten a fabulous dinner, so could only look. 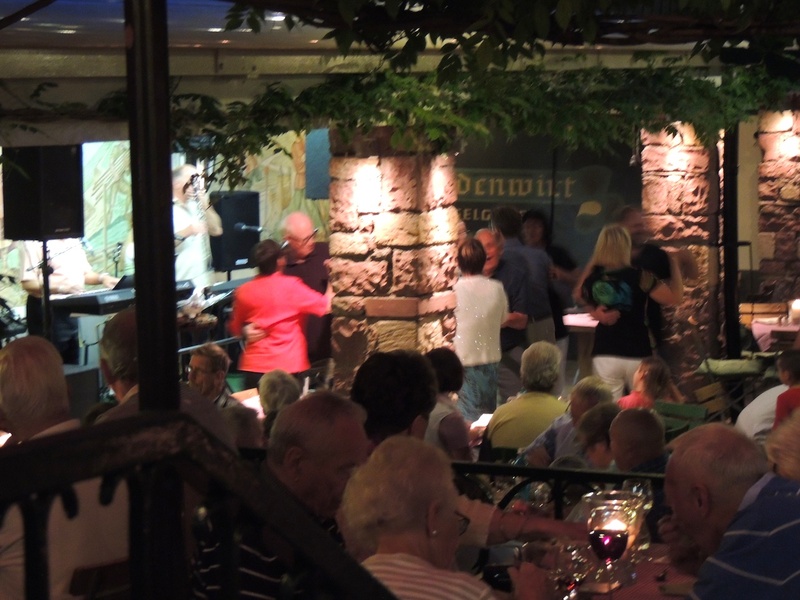 We found a lively bar, and sat for a while enjoying a glass of German wine and listening to a group playing really old songs from the 50’s to the 70’s. People were really enjoying themselves on the tiny dance floor in the corner. 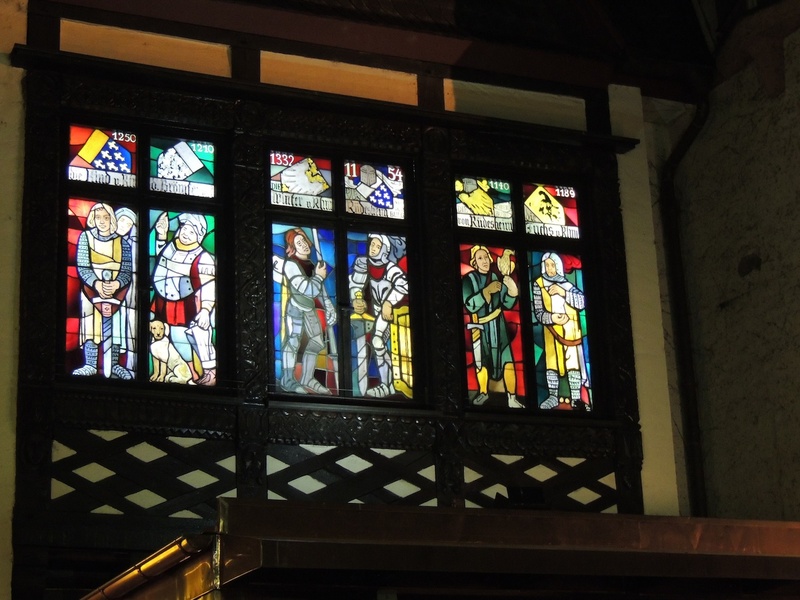 On our way back to the ship, I noticed these stained glass windows, not in a church, but on the side of a pub/restaurant. 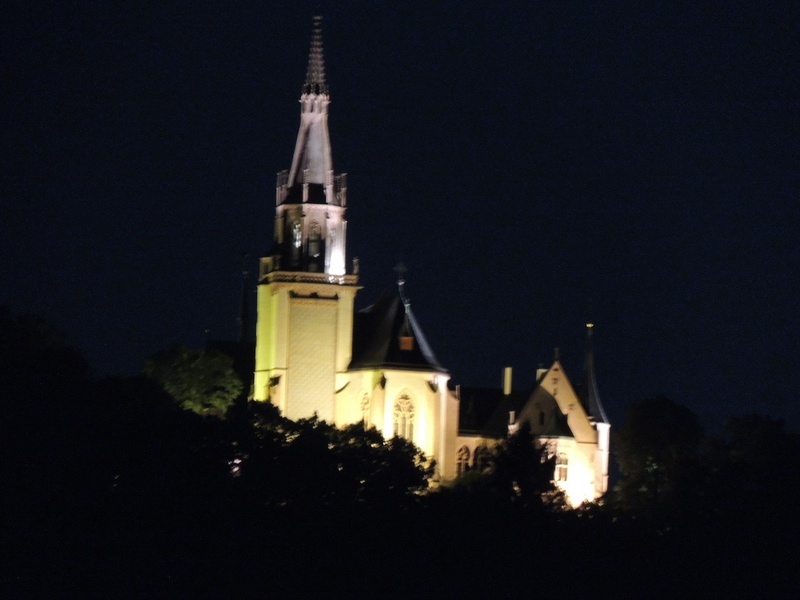 It was a lovely evening, and a pretty castle was outlined against the night sky. We had to wait again before crossing the railway line back to the ship. 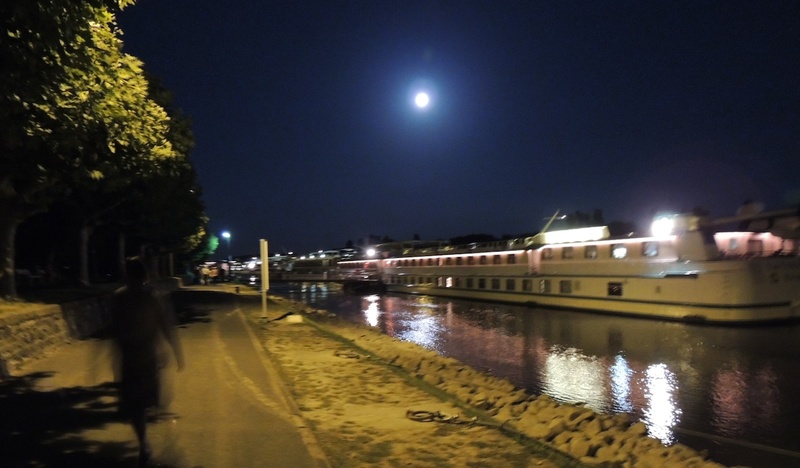 Then it wasn’t far along the tow path back to our home on the water, under the moon-lit sky. We are now docked in Koblensk, and I’m going to do some exploring this afternoon. 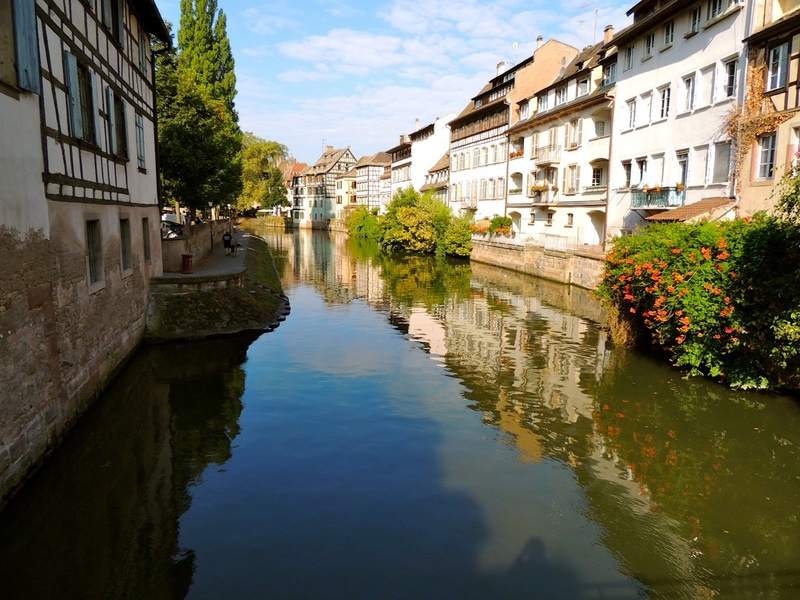 Beautiful canal in La Petite France. 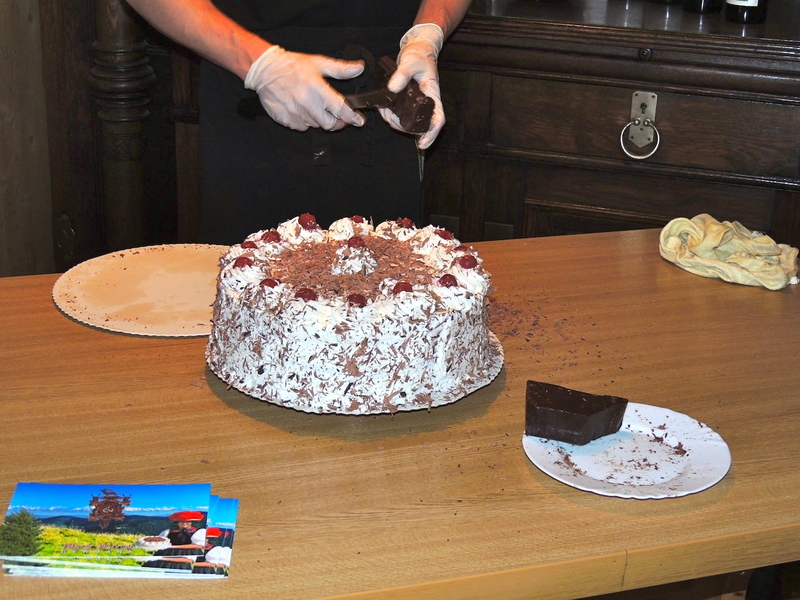 Yesterday our ship docked in Breisach, and we went on a morning tour and were able to take a walk in the Black Forest. It was a lovely morning as we set out for our half hour mini-hike through the picturesque landscape. 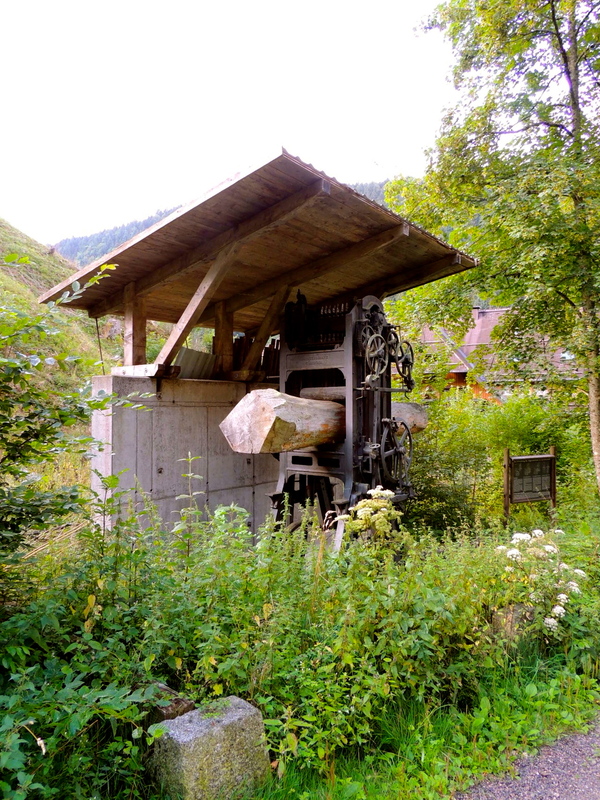 One of the first things we saw was this old log-cutting machine. Quite a nifty contraption. I wonder how many men it took to lift the heavy logs into it. 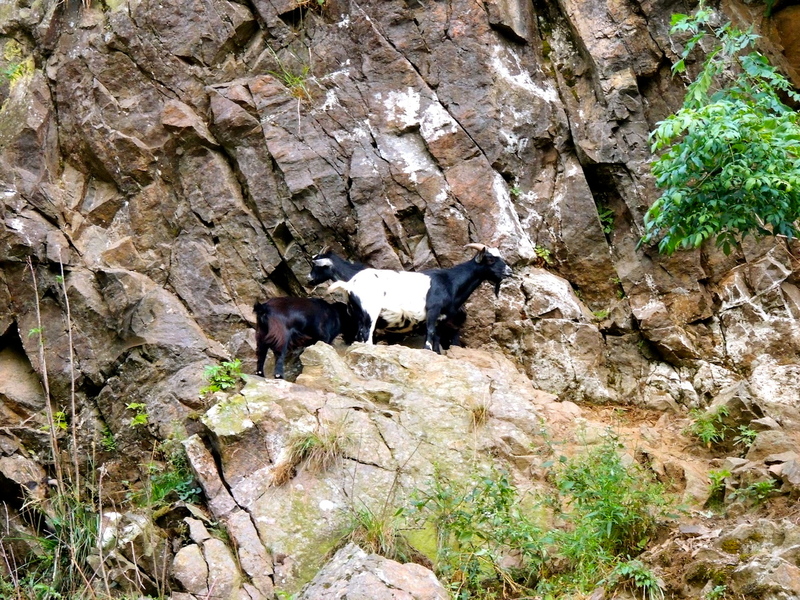 These mountain goats looked quite content and took no notice of us at all, as they nibbled away at the foliage growing out of the rocks. 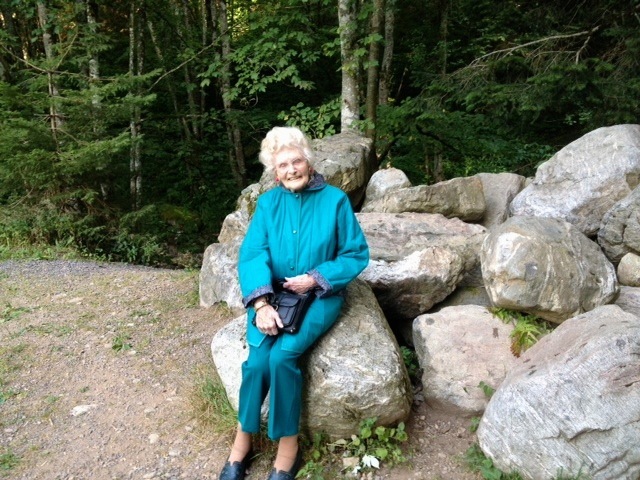 After a while, the trail became quite steep and the ground underfoot was very rocky, so we decided that my 100-year-old MiL, shouldn’t go any further. 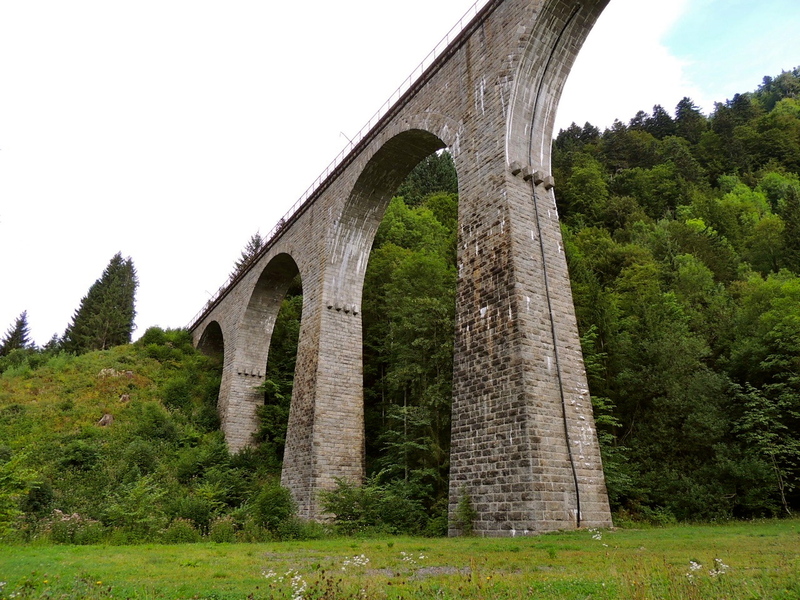 We left her sitting on a large boulder just under this viaduct, whilst the rest of us climbed up to the top. She was quite happy to wait here, and when we got back about twenty minutes later, said that she’d been listening to the birds, and had seen a train going over the top of the viaduct. Here are a few pics of what we saw on our way. 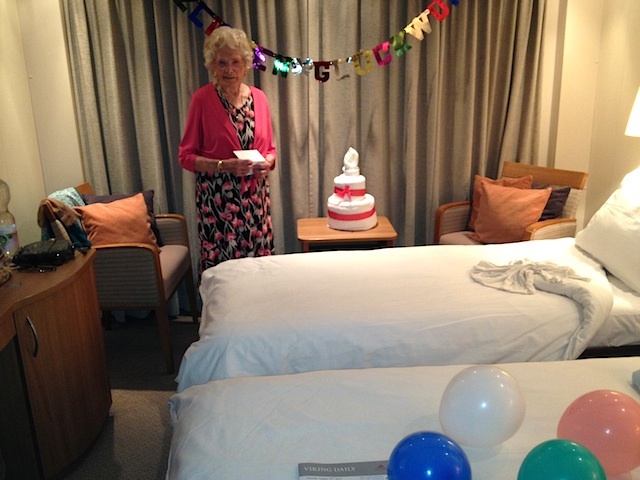 Just click on any image to see the gallery. I have so much more to tell you and show you, but now I have to get showered and dressed so that I can have breakfast before our trip into Strasbourg. 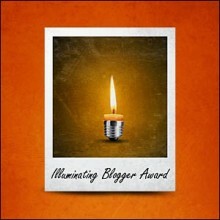 I’m sorry I haven’t managed to get to all of your blogs lately. 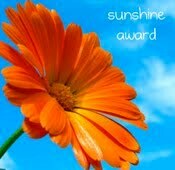 Thank you so much for your lovely comments and visits. I’m feeling really carefree at the moment, having just finished my packing. Next time I post, it will be from the cruise ship in Basel. Yay!! 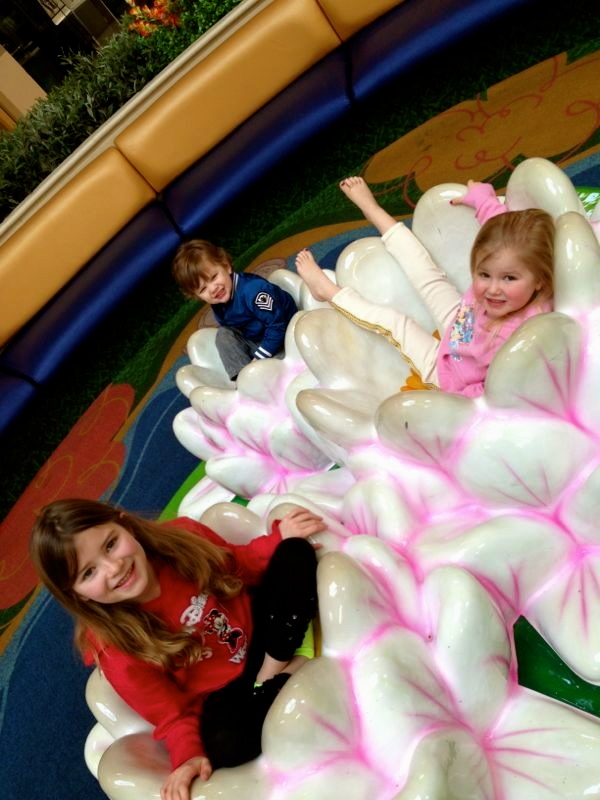 The trio having fun at a Florida mall play area. Having fun at the mall. 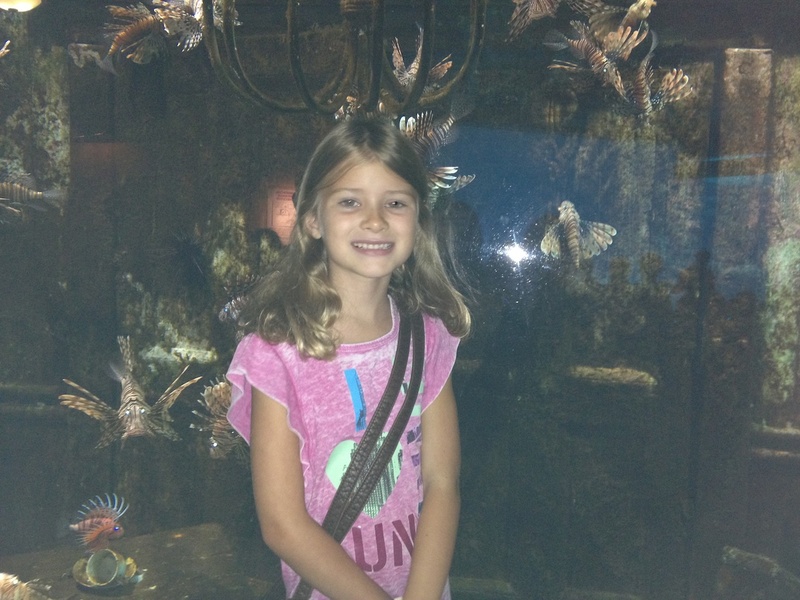 Sienna’s visit to the aquarium in South Africa. 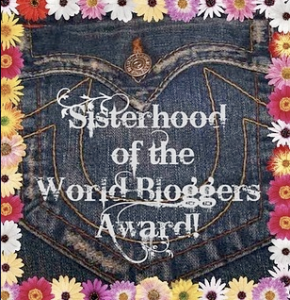 To visit the WordPress photo challenge this week, just click here.